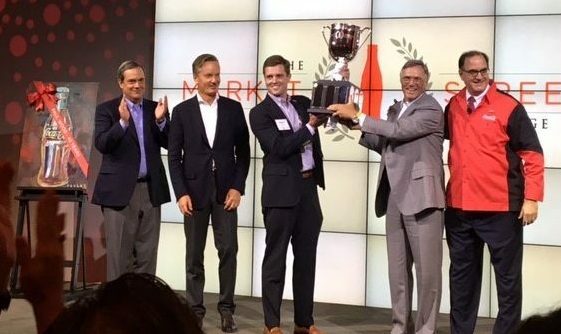 August 4, 2016 – Atlanta, Georgia: To an audience of Coca-Cola bottlers from across the U.S., executives of The Coca-Cola Company announced Coca-Cola UNITED, the second largest privately held Coca-Cola bottling company in the U.S., as the first recipient of the prestigious Market Street Challenge Award. What is the Market Street Challenge Award? 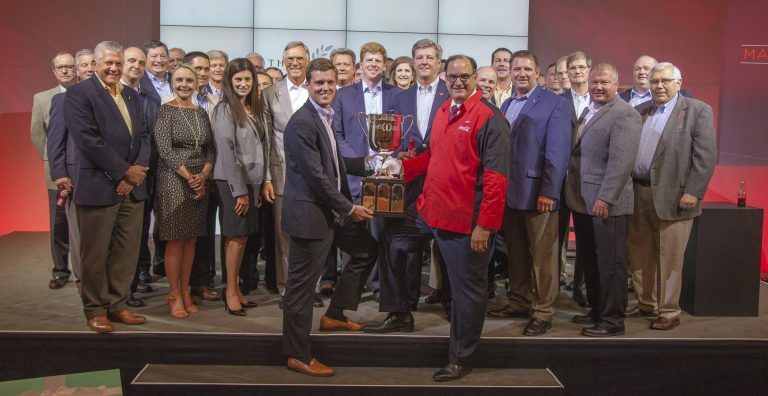 Launched in November of 2015, the Market Street Challenge is a healthy and unifying competition of every Coca-Cola bottler in the U.S. strategically designed to promote executional excellence and continuous improvement in local Coca-Cola markets. How was the winner selected? From a baseline set in November 2015, improvement was measured in March and June through market audits in the following five categories: beverage portfolio availability, customer growth, expanded retail space, cold drink equipment and in-store activation. On July 31, in the final phase of the competition, nine bottlers qualified to present business cases for each category. These bottlers collectively reviewed the business cases executed by Coca-Cola employees in the local markets they serve. Coca-Cola UNITED was voted to be the first deserving recipient of the Market Street Challenge Award. A Tiffany-designed trophy and specially commissioned Steve Penley painting will be proudly displayed in the corporate offices of Coca-Cola UNITED in Birmingham, Alabama during the coming year.